Graffiti crews are willing to risk anything for their art. Called vandals, criminals, even creative terrorists, graffiti artists set out to make their voices heard and alter the way people view the world. But when one crew finishes the biggest graffiti bomb of their careers, the consequences get serious and spark a public debate asking, "Where does art belong?" 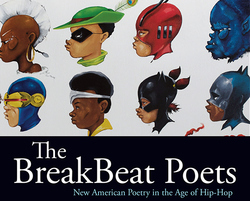 Kevin Coval is the author of Schtick, L-vis Lives, the American Library Association "Book of the Year" Finalist Slingshots: A Hip-Hop Poetica, and an editor of The BreakBeat Poets. Idris Goodwin is a playwright, spoken-word performer, and essayist recognized across mediums by the National Endowment for the Arts, the Ford Foundation, and the Mellon Foundation. "A romantic ode to the art of graffiti and the act of tagging, a piece that demystifies authorial signatures and charts the storied history of graffiti art in Chicago, shouting out its great artists and their canvases, from Kennedy underpasses to CTA train yards." "A raw, visceral narrative that gives graffiti artists the humanity and genius the headlines rob them of." "This is a piece about the overwhelming urge not just to create art, but to get it seen—if only by a scant few before the sandblasters come along." "A provocative play... that raises philosophical and political questions that are already generating heated discussions among theatergoers of all ages." "A wildly wrong-headed and potentially damaging work — No amount of classroom discussion will scrub clean the irresponsible ideas promulgated in this play." "It was at once an act of artistic expression, social protest, and criminal vandalism—guaranteed to rattle the art world and media establishment, set the Twittersphere abuzz, and send the young rebels underground, if not to jail. This world premiere, written by Idris Goodwin and Young Chicago Authors artistic director Kevin Coval, is simultaneously celebratory and cautionary—clearly sympathetic to the artists' point of view, but not blind to the impact their reckless act would have on their own lives." "This production is sharp, exciting and stimulating, both visually and emotionally. It will entertain, educate and is guaranteed to prompt heated discussions about the nature of art and the place for graffiti in our world." "This is a piece about the overwhelming urge not just to create art, but to get it seenif only by a scant few before the sandblasters come along." "A wildly wrong-headed and potentially damaging work  No amount of classroom discussion will scrub clean the irresponsible ideas promulgated in this play." "It was at once an act of artistic expression, social protest, and criminal vandalismguaranteed to rattle the art world and media establishment, set the Twittersphere abuzz, and send the young rebels underground, if not to jail. This world premiere, written by Idris Goodwin and Young Chicago Authors artistic director Kevin Coval, is simultaneously celebratory and cautionaryclearly sympathetic to the artists' point of view, but not blind to the impact their reckless act would have on their own lives."